hii everyone……thanky you so much for so much love lin my last episode……thank you than you…………..and here i m promising you all that this one will be a happy ending ff.ragsan will be surely inted………but yes their will be twist and turns pain hurt…love everything…..so plz do read and try to undesratnd becaoz itss nedded for story…. Sanskar Laksh and the family comes to Gadodia mansion…….sonal who is already present there is super shocked to see sanskar there……but sanskar doesn’t notices her………..
Sanskar and others laugh seeing him……..
Everyone looks towards stairs……..and sees swara and ragini both coming downstairs ragini is little uncomfortable…….ragini is looking down……where as someone is super shocked to see her……. Yes sanskar maheswari is super shocked to see ragini infront of his eyes………..
Ragini and swara both take blessings of elders….ragini still didn’t notices sanskar……..
Sujata- here meet my elder son……a workaholic businessman sanskar maheswari……. Listening to his name….ragini’s heart starts beating fast…….ragini who was facing her back towards sanskar turns to face him……….and is shocked to see sanskar infront of him……. She also gets emotional…….she gets teary eyes…..sanskar sees her….from top to bottom……. Ragini(in mind)-finaaly you are infront of me……..sanskar…..my sanskar…..you changed so much……..you had become more handsome……..
From back someone calls him……he knows the voice very well…. Ragini looks at him teary eyes…….she runs to him……..and was about to hug him…….but he turns to other side………ragini is hurt with his behavior………. Ragini- sanskar…. I know many things happened 1 year back…….but I really need to talk to you…. Sanskar- I don’t have even 1 minute to spend with you and listen to you stupid fake stories……..
Sanskar turns to face her…………and sees ragini with teary eyes…..nodding no to him……. Sanskar- what and why should I listen to you……..i know you are a big gold digger………..i still remember that day……….what you said to me………and now what are you doing……….you rejected me by saying……that I am just a mere homeless jobless man…………right ragini Gadodia………..
Ragini- sanskar……it was all midunderstanding plzz listen to me once……..
Before ragini could say anything further sanskar cuts her and shouts…. Sanskar- stop it ragini Gadodia………..i know you very well……..now you trapped my brother Laksh seeing him rich ……..and now seeing me successful you want me too………such a cheap and shameful girl you are………a big gold digger………atleast you should have some self respect……that you are getting married…………but you you want both you husband and husband’s brother………. Sanskar pushes her……..due to which she trips and is about to fall in the swimming pool…..near………..but sanskar saves her from falling by holding her hands……..ragini see him………sanskar pulls her due to which she falls on his chest……ragini looks at him………..
Ragsan shares an eyelock…….suddenly sanskar pushes ragini slightly so she doesn’t falls this time………and leaves from there………..
Sanskar turns and looks at her from behind with teary eyes……..he wipes his tears and leaves from there………. Ragini- why god……why always it happens to me………..he called me characterless…..was this was my destiny………..
Ragini cries……..and recalls what happened 1 year back……. Sanskar- ragini…….dont lie I know you love me………and I also love you……and after what happened yesterday……..its evident ragini that we both love each other…..
Sanskar tries to hold ragini;s hand……….but ragini pushes him out of the room……..and closes the door………. Sanskar picks up his guitar and leaves from there………….while ragini sees him from window…………both looks at each other with teary eyes……….ragini closes the window………..and shaury looks at the closed window sadly………..he goes from there……..
After some time………laksh comes to sanskar…..
Laksh- hey bro come you didn’t meet her…..
Laksh comes with sanskar……to a girl……..
Laksh- bro she is swara…….my finance…….my would be wife………and swara this is sanskar…..my elder brother………..
Sanskar is shocked…….and regrets a bit for whatever he told to ragini……..
Sanskar(in mind)- whatever………this may be wrong……..but she is a gold digger it’s the truth………that time she rejected me………and now knowing that I m big succesfull rich businessman………she wants me back…………no no…..i am sanskar maheswari……I am not a toy with which she will play……….i too had emotions……. Sonal- hello everyone……..so today is my bestie swara and Laksh sangeet ceremony………….so lets begin the fuction………with the a couple dance of our love birds………..
Suno na sangemarmar, ki yeh minaarein…. 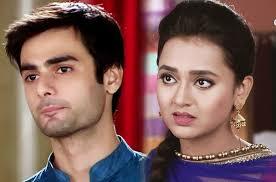 Ragini looks at the couple and imagines herself and sanskar dancing…. Ye dekho sapne mere …Neendo se hoke tere..
Ragini comes out of her dream world hearing clapping sound……..sonal nudges her…..and askher where was she lost……..ragini feels embarrassed………and goes from there…. Everyone congratulates and appreciates Laksh- swara……. Spot light falls on stairs…….ragini comes their singing……. Aati hai saans main saans ……..
Jab tum hote hoo….jab tu hote hoo………..
Ragini comes behind sanskar….and then passes by him…. As soon as ragini finshes singing…….sanskar starts humming………..evryone looks at him surprised…..because sanskar’s family didn’t knew about his singing talent……..but ragini knew…….she smiles seeing him……..
Do Lafz Ki Hain, Baatein Kaheen Hai..
Kyoon Darmiyaan Phir, Ruki Ruki..
Keh Bhi Na Paaye, Reh Bhi Na Paaye..
Kyoon Bevajah Hai, Yeh Bebasi..
Tum Mein Hum Hain, Hum Mein Tum Ho..
Tumse Hum Hain, Humse Tum Ho..
Kismaton Se Milte Hain Do Dil Yahaan..
At night…..ragini couldn’t sleep…………otherside…….sanskar also could not……..
Otherside ragini remembers the old memories……holding her phone….in which sanskar and her pic is there…. A bubby girl is shown…entering the college….she is looking damn hot…….she is every boys crush…………everyone wants to impress her……..but she never gives damn to anyone……….. Her face is revealed to be ragini…….